The targets of Q Line production are made according to International standards (ISSF), defined regulations of International shooting sports. The paint used on the clays has got a Hidrofoba paint scum that makes them waterproof. Weight distribution of the target's form, provides it's straight trajectory during the whole flight and a stable speed. Q Line produce both regular (tar pitch) and ecological targets (ideal for countries with the existing demands towards a pure material). Clays are characterised by the low consistency of poly-aromatic substances used in the manufacture. These targets are used in countries where such environmental regulations exist. Besides the targets of a standard orange or black colour we can offer by request, also other colours of targets: green, blue, yellow-light-green or white. 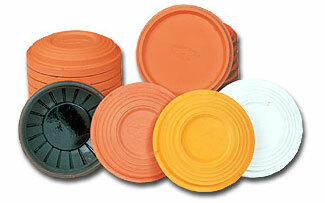 Wesley & Alison Hann are the sole UK Distributor for Q Line clays - please contact for further details. "Wesley, thanks for following up on our clay order. They arrived late friday morning. We started to use them this morning(sunday) and had nothing but positive comments about them. Not a single no bird from our traps. Myself and a few others have already shot your clays at hollow fosse and also farmington quarry which prompted us to buy from you. A good clay at a great price. Many thanks. Sean Pipe. Chairman. Wanborough CPC."